Well, it’s that time of the year again! A time to count our blessings and turn our attention towards all those who are less fortunate than we are! 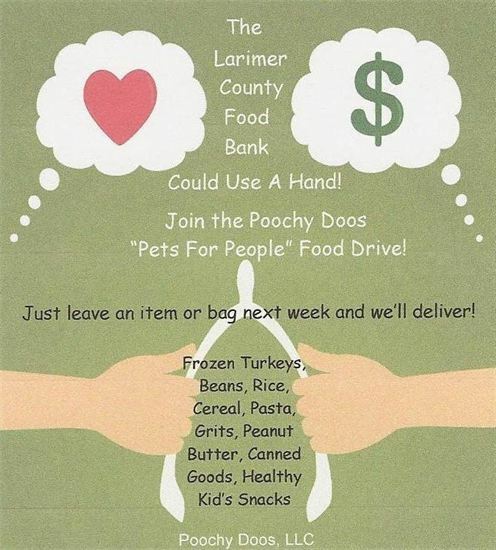 On behalf of the entire pet care team here at Poochy, we’d like to extend a special invite to all our dog walking and pet sitting clientele to join us this year in donating much-needed food items to the Food Bank for Larimer County! Want to donate to Pets For People Food Drive – just give us a call to let us know! Last year our clients made our Food Drive a huge success! We donated a bunch of turkeys and bags and bags of food, including several fresh-baked pumpkin and apple pies! Thanks to you, Poochy Doos, LLC was able to pitch in and contribute food to the neediest in our community! Just leave a bag of food next week and we’ll swing by and pick it up during our normal visit time. We will then coordinate a time to drop everything off at the food bank. We’re looking to give even more this year! Thank you in advance for your generous contributions. We have all been very touched by everyone’s response!